Glorious weather, a Royal wedding, and two football cup finals. How could Saturday 19th May 2018 be any better? Well, the answer to that of course is connected to 38 singers, a musical director, and an organist making their collective way south from Scotland to the awesome Durham Cathedral to sing Choral Evensong. We absolutely LOVED Durham, a true high spot in our choir’s ten year history, we were made to feel very welcome, and we look forward to a return visit at some time in the future. Directed as ever by the wonderful Frikki Walker, we sang the responses by Herbert Sumsion (very appropriate since they were written by him for Richard Lloyd and Durham Cathedral choir), Sir John Stainer’s B flat setting of the Magnificat & Nunc Dimittis, and the somewhat epic Evening Hymn by Henry Balfour Gardiner, so plenty opportunity for our organist Kevin Duggan to explore the tubas and 32′ stops of the magnificent cathedral organ, the showpiece of Durham based organ builders Harrison & Harrison . That draws to a close the first half of the 2018 season of RSCM Scottish Voices, other than us singing as part of the massed choirs at the 2018 RSCM Scotland Triennial Festival in Dundee on 2nd June, as well as during that service singing Let all mortal flesh keep silence by Bairstow as our own contribution on the day. We have exciting trips in the second half of the year, with visits to St Mary’s Episcopal Cathedral in Edinburgh, Dunblane Cathedral, and Kings College Chapel in Aberdeen, but before all of them we are very much looking forward to our residential rehearsal weekend in August when we will be returning to the Scottish Police College to learn some repertoire and to socialise together. Both very important activities! Watch this space for details of our music lists, and please like our page on Facebook, and follow us on Twitter, to keep up with all our news and activities. Our 2018 season started in fine style yesterday with a totally unaccompanied Choral Evensong in the wonderful acoustic of the mediaeval quire of historic Bothwell Parish Church, directed by Frikki Walker and with the service led by Rev Jim Gibson, Minister of Bothwell and Chaplain in Ordinary to Her Majesty the Queen in Scotland. 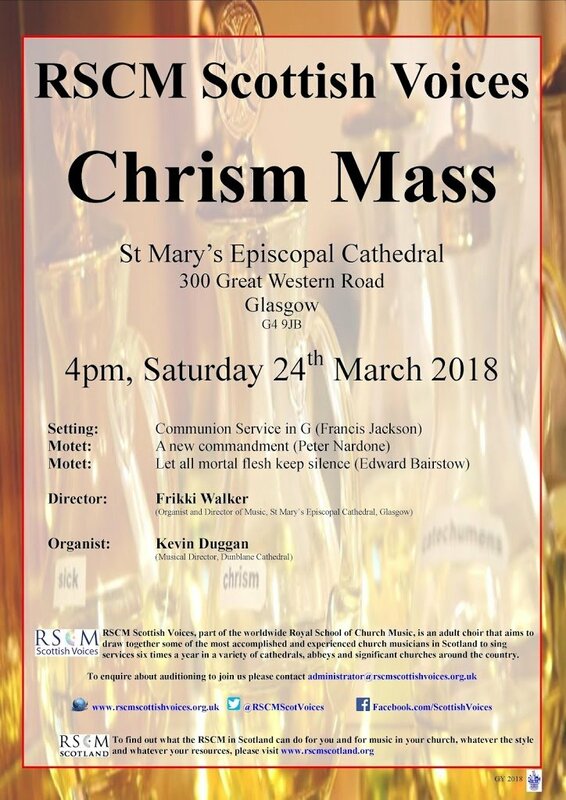 Our thoughts turn now to our next meeting, on Saturday 24th March, when at 4pm we shall be providing the music for the Chrism Mass in St Mary’s Episcopal Cathedral in Glasgow, led by the Bishop of Glasgow & Galloway, the Right Reverend Dr Gregor Duncan. Frikki will, as normal, be directing the choir and we are glad to be accompanied again by Kevin Duggan of Dunblane Cathedral. 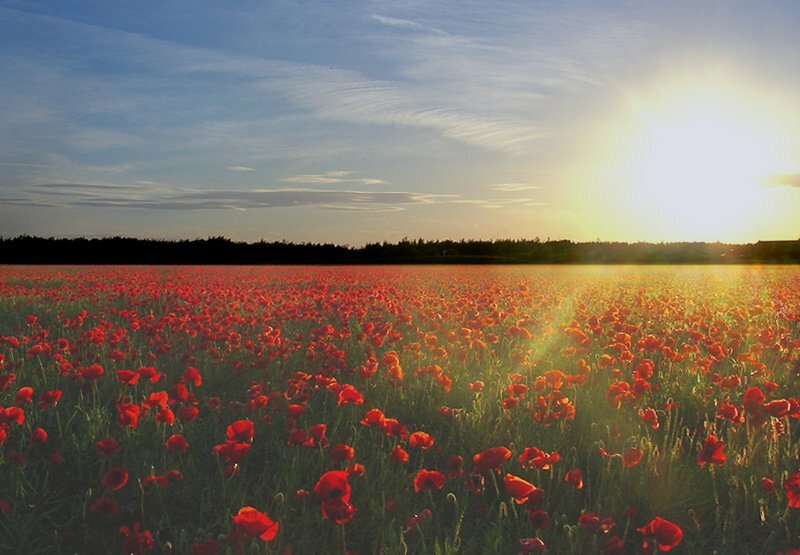 Our 2017 season drew to a close yesterday, fittingly on Armistice Day, when we sang a Remembrance themed Choral Evensong in St Paul’s Episcopal Cathedral in Dundee, directed by Frikki Walker and accompanied by Kevin Duggan. St Paul’s continue to be most welcoming and generous hosts, and we look forward to future visits. Thanks are particularly due to the Pastoral Musician Stuart Muir for his help in making the arrangements and for his tireless work on the day making us tea and coffee and generally being helpful, and to the Provost the Very Revd Jeremy Auld not only for allowing us to visit but for his sensitive leading of the service and his singing as cantor in the responses. So our year finishes and whilst the thoughts of our singers turn towards the music they will sing in their home choirs over Advent and Christmas our Musical Director and particularly our Administrator put their minds to the various behind the scenes changes involved in the impending change from oversight by the RSCM Scotland committee to oversight by RSCM HQ in Salisbury, and all that entails. Initially a “child” of the RSCM Scotland committee back in 2008 the choir has gone from strength to strength with the magnificent support of the committee since we first sang a service together in January 2009, and we thank committee members past and present for that support, whilst looking forward with excitement to the new chapter in our corporate life and the opportunities that may present themselves. 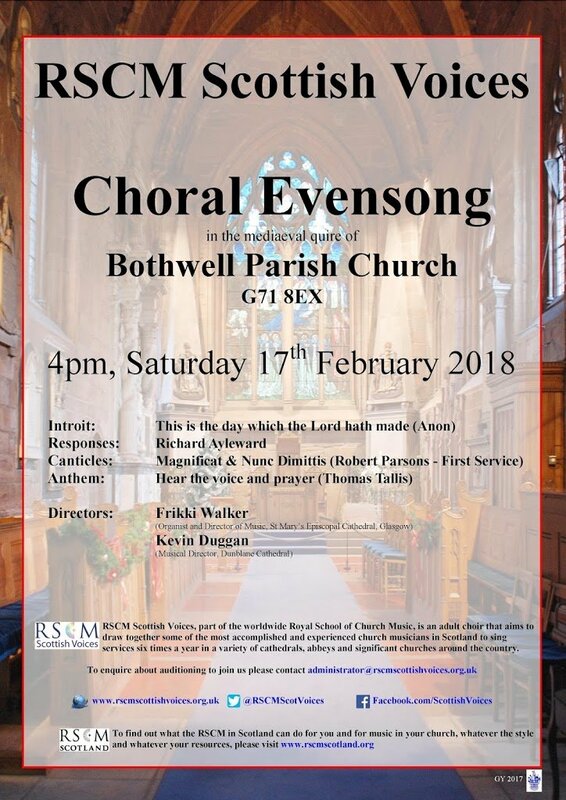 And looking into the near’ish future, the next time we sing together will be in the Mediaeval Quire of Bothwell Parish Church in Lanarkshire, when we will sing an unaccompanied Choral Evensong at 4pm on Saturday 17th February 2018. We hope to see you there! 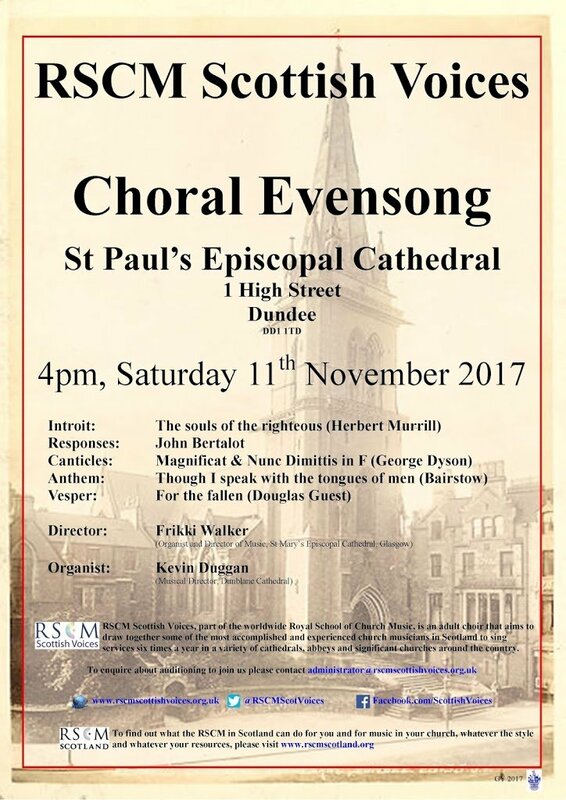 After a most enjoyable Choral Evensong yesterday in St Mary’s Episcopal Cathedral in Glasgow under the direction of James Kealey and with Christopher Nickol accompanying, our thoughts turn to our next event, the last of 2017, when we will be singing a special Choral Evensong for Remembrance at 4pm on Saturday 11th November in St Paul’s Cathedral, Dundee, led by our Musical Director Frikki Walker and accompanied on this occasion by Kevin Duggan, Musical Director of Dunblane Cathedral. 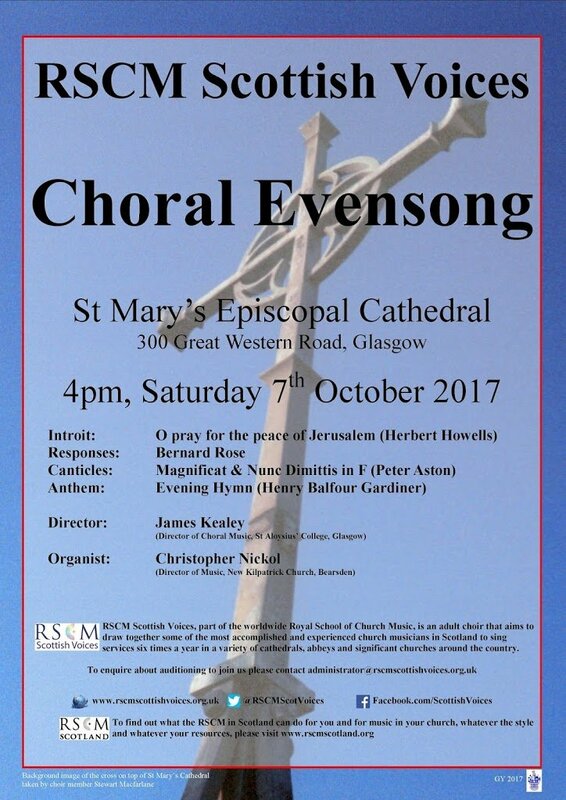 Our next meeting is a return to the familiar and much loved territory of St Mary’s Episcopal Cathedral in Glasgow, where our Musical Director Frikki Walker is Director of Music and where a fair number of our singers are in the Cathedral Choir, to sing Choral Evensong at 4pm on Saturday 7th October 2017. While the venue is very familiar to us, this will be a first for RSCM Scottish Voices since because of the recent departure to Ely of our now former Assistant Musical Director Richard Walmsley and the non-availability on this occasion of our Musical Director Frikki Walker, we will be directed and accompanied by James Kealey and Christopher Nickol respectively, the very first time that any of our meetings hasn’t featured either (or more usually both) Frikki or Richard. We are of course in safe hands, we wouldn’t be so foolish as to experiment wildly. James has recently moved to Glasgow from Somerset where he was Senior Organ Scholar and Second Assistant at Wells Cathedral (where Frikki was previously a Vicar Choral in the choir at the same time that Richard was a Treble in the choir, small world, isn’t it?) and he has taken up the position of Director of Choral Music at St Aloysius’ College in Glasgow (coincidentally replacing Keith Roberts who until he moved south a few weeks ago sang countertenor in the choir of St Mary’s Episcopal Cathedral under Frikki).